Hi friends! 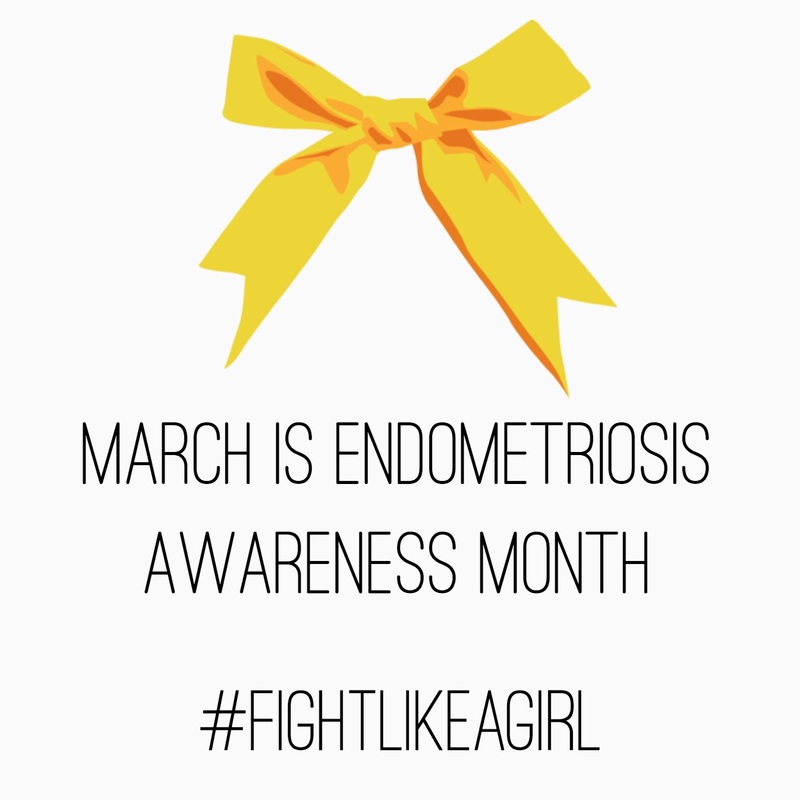 March is Endometriosis Awareness Month so........I'm being brave and sharing my Endo story today. Readers, please be warned that this post talks about the female reproductive system. Endometriosis is a disease that destroys that system. Please only read this if you are comfortable with that. Please also be aware, that I don't write this story for pity. It's scary to share such personal details. But, I share this story to spread awareness because I don't want others to suffer what I have suffered. If I can prevent a woman or girl our there from having her disease progress to the point mine has, this post will be worth it. So let' start back in 8th grade. Way way waaaaaay before I had ever heard of Endometriosis or knew that it ran in my family. I have this class photo- and it's one of those photos where I can remember exactly how I was feeling when it was taken. I was in pain. My period had started that day and it was bad. It's crazy to look back at that photo and see the pain in my face. I thought I hid it better than that. 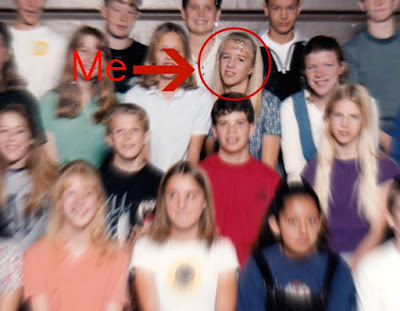 But, as a young girl, how was I to know that bad pain with periods was not normal? I went through life thinking that was what every woman experienced. kinda sad. Fast forward through my teens and into my early twenties, my college years. It started getting worse. I could never make it through a period without being on ibuprofen constantly until it was over. Some days I missed work. I had room mates with Endometriosis, but never ever thought I had the same thing. I never thought I had a problem. I thought I was normal. Then after I got married, it got worse again. I partially blame the high estrogen birth controls I tried and other meds. The rest I blame on genetics and chemicals in my environment. I developed really awful migraines with each period. I was extremely lucky to be able to get pregnant early in life. My pregnancy was such a relief from the period pain and the migraines were so much better too. After my son was born, the periods started again after only 2 months, in spite of nursing and the pain was much much worse than before. I saw several gynecologists. They all told me that period pain was just a part of life, to just deal with it. Take birth control..... blah, blah, blah. Total garbage! Looking back, at that point they should have been doing some major ultra sounds to figure out the cause of my pain, but ya know doctors.......... just slap on a band-aid and get this case out of my office! That's how I was treated. Very tragic. I quickly learned through trial and error that my body absolutely rejects synthetic hormones. Birth control was not an option and besides, I wanted more kids! Lots more kids. We tried for baby #2 for a while with no success. Then the pain finally got so bad that I knew something was wrong. I was having intense pains not just on my period but during the whole first two weeks of my cycles. One day the pain was so intense I almost went to the emergency room. Luckily I was able to find a good doctor who saw me that same day. He did the right thing. Some investigative work with ultra sounds. It was soon discovered that I had cysts on both of my ovaries. Not the kind of cysts that go away on their own either. These were what they call "chocolate cysts" (gross name I know), cysts filled with blood. A sure sign of Endometriosis. I remember very clearly the moment I called the doctor to see what they found from the ultra sound. The nurse told me that they were chocolate cysts, caused from Endometriosis. I choked. I couldn't utter a word. I was in total shock because I think I knew at that moment, that my fertile days were over. The nurse told me not to be worried, but deep down, I knew it was bad. My life as I knew it was over. I saw a reproductive endocrincologist next. She did more tests, each with more devastating findings. It was absolutely heartbreaking to hear her say that my only chance for more children was through IVF (invitro fertilization). I seriously considered that option. I battled my insurance for a month to find out if it was covered only to realize at the end of that search, that it wasn't right for me. I had come to know my own body pretty well. It doesn't do synthetic hormones. I knew my body would reject IVF. But then, I had no more answers. I pleaded with the Lord for help to know what to do. I knew that everyday I lived with that disease, every day I did nothing, every cycle I went through, it was getting worse. But for that time, the Lord was silent. I'm sure now that He was waiting for the right time. I wasn't truly prepared for the answer (which was eventually hysterectomy). So I waited. The period pain became akin to that of having the flu. I was achy and in so much pain I couldn't get out of bed for a few days every month. The pain became more present. It became an every day thing. My body was too tired to move some days. The fatigue was astounding. 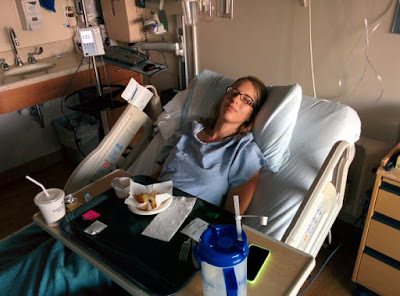 After 6 months, I decided to try a laparoscopic surgery. It was intense. I had Endo growths everywhere, even on my diaphram! I had an amazing surgeon who removed as much as he could while trying to preserve my reproductive organs. For a little while, I felt much better too. But it didn't last. We tried for another pregnancy for another 6 months. The disease just grew back and no baby. At that point, I was at a crossroads. Keep trying for more children, with the teeniest-almost-no-chance-at-all, or have a hysterectomy. I had to choose my health. I had a 6-year-old who desperately needed a healthy mother. So that's what I choose. I had the hysterectomy and removed one ovary. We were trying to keep me from going into menopause too early. It was the right choice for that time because a hysterectomy is such a major adjustment in every part of your life. Emotionally, it was much much harder than I expected. I truly grieved the loss of those children I wanted as if they had really died. It was that sad for me. I also grieved the loss of my reproductive organs, which may sound strange, but it was a part of me that was gone. I'll never get that back. Granted it was a very diseased part of me (which now I don't really miss) but it was a loss of myself. After that, I thought I was in the clear. No more periods- that was good, but it only took a few more months for more Endo to return. As long as you still have a functioning ovary, your body still experiences cycles. You still produce the estrogen that makes the Endo grow. So it came to the final blow......... surgical menopause at age 31. This is extreme. This is the worst-case scenario here and it was me. Lots of women can manage their disease with surgery and drugs, but mine, nope. I had to get rid of that last ovary. It was still causing so much pain. So I got rid of it and my body was in shock for a few months. Right now, I feel like I'm just barely starting to come out of it, with the help of some bio-identical hormones. It's a tough and risky thing to do, but my body can't function without at least some estrogen and progesterone. Don't let any doctor tell you to just "live with it" or that "it's normal" to have that much pain! You know your body best and if something really feels wrong, chances are you're right. Don't take a chance on not checking. If a doctor is not willing to work with you and dig deep to find the problem, move along to a better one. 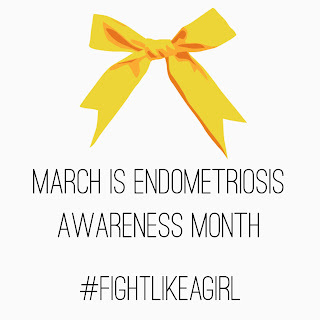 If someone you know has problems with painful periods, encourage them to get checked out for Endometriosis. The sooner you find it the easier it is to treat and the less tragic your case will be! Fight for yourself! No one else will be motivated to fight as hard for you as you will! And last of all, pray. Even if you don't believe in a higher power, you have to pray. He's there, I promise and He hears you. So that's it for now. My story is not ended because Endo currently has no cure. So even with a hysterectomy and bilateral oophorectomy (removal of both ovaries) there is still a chance it can grow back. It's much much smaller, but it will always be there. Please take a moment to share this with anyone you think could benefit. If I had to suffer at least I want it to be of some good to others. Thanks for sharing Elise. I can only imagine the pain you've gone through, as well as the courage it took to write this. While my story is drastically different, I agree with so much of your advice. I hope you're feeling totally like yourself - the healthy version - again soon. Hey you and I have this in common. However I listened to those doctors who dismissed my pain. When I finally had my Larp my lady plumbing was stuffed. But IVF was successful for us when I was 38 and like you I'm a mum of one. I'll be informing my daughter when she's ready to go through it herself. Thanks you- I'm glad I could pass on some of my knowledge. I hope it helps you! Best of luck my friend and take care of yourself! Thanks for your kind words Patricia! I hope you are right. thank you for writing this. My daughter suffers and I wish I had helped her sooner. The doctor's only suggestion was to put her on birth control at age 14. Which we didn't do. She has had a pain -filled life, and I am sorry about that. Wish I'd read your story earlier, but now I know and maybe I can save someone, my granddaughters?, from such a life.